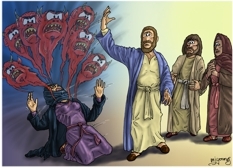 It was early on Sunday morning when Jesus rose from the dead, and the first person who saw him was Mary Magdalene, the woman from whom he had cast out seven demons. Unspecified, since this scene occurs earlier in the life of Jesus. The sun illuminates this scene from the right. Notice the dark shadows around Mary, representative of the evil spirits coming out of her. The resurrected Jesus, Mary Magdalene, James/Cleopas (son of Alphaeus) and Mary (wife of Cleopas – Joseph & James Little’s mother – sister of Mary (mother of Jesus)). 01) (Previous page) Mark 16 – Resurrection of Jesus – Scene 06 – Mary Magdalene (Worship version). In which the resurrected Jesus appears to Mary Magdalene near the tomb. 02) (This page) Mark 16 – Resurrection of Jesus – Scene 06 – Mary Magdalene (Daemon version). 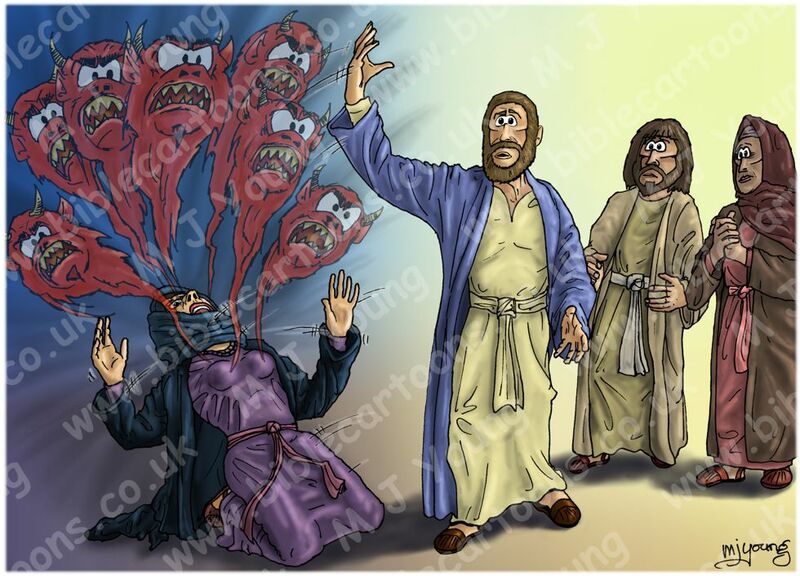 In this version Jesus the Christ is casting out the seven daemons or evil spirits that were in Mary Magdalene. This event would have happened before the crucifixion & resurrection, probably when Jesus first met Mary. Notice that the daemons or evil spirits are slightly translucent, so that you can see the figure of Mary Magdalene through them. The original version of the daemons made them look like giant floating raisins… not the effect I was after, so I re-designed them to look like the above – a lot more vicious in appearance!